Guided imagery meditations are useful in many aspects of our lives. Whether we want to relax, obtain a sense of balance or dig down into our creativity, meditating can bring us to a journey of positivism and calm. While guided imagery may sound like you’ll need an experienced therapist to help you go through the process, there are meditations that can be done by yourself in the comfort of your home. Specifically, scripts on guided imagery for sleep, for a confidence boost and for losing weight are available for people to use for their self-meditation. These scripts may be recorded and played while you meditate. Some say that it’s more beneficial when you hear your own voice guiding you through the journey. Determine what works for you regarding planning your script. There are different ways to go about writing your meditation scenes. For some people, they prefer to discover the flow of events when they are already writing on paper or typing on the computer. On the other hand, other individuals tend to plan their script by creating a list of the things they want to include. In this way, it will be easy for them once they finally decide to sit down and write the scenes. Other people, however, can write their scripts without any notes because they have gone through the visualization themselves a lot of times in the past. In order to be focused in your writing, it’s best to be in the right frame of mind. You can take a relaxing meditation or do some breathing exercises first because it would be much easier to visualize the scenes when you’re in a calm state. This will also help you personally experience your script as you write it, which is highly recommended considering that guided meditations should be experiential exercises. When writing your script, make sure that you have a specific purpose in mind. Any guided imagery meditation should aim towards healing and positivism. And most importantly, each script should have one aim whether it’s to help in boosting the listener’s self-esteem or to simply avoid overeating, among others. Read your completed script aloud or have someone check it to see if there are some parts that may not be suitable for guided meditations. One common mistake is to write long and overly descriptive sentences that could possibly overwhelm your mind and senses. Remember that meditation scripts are meant to be spoken slowly. Another area to check is whether there’s too much talking in between the inhales and exhales, otherwise, you will be holding your breath too long. 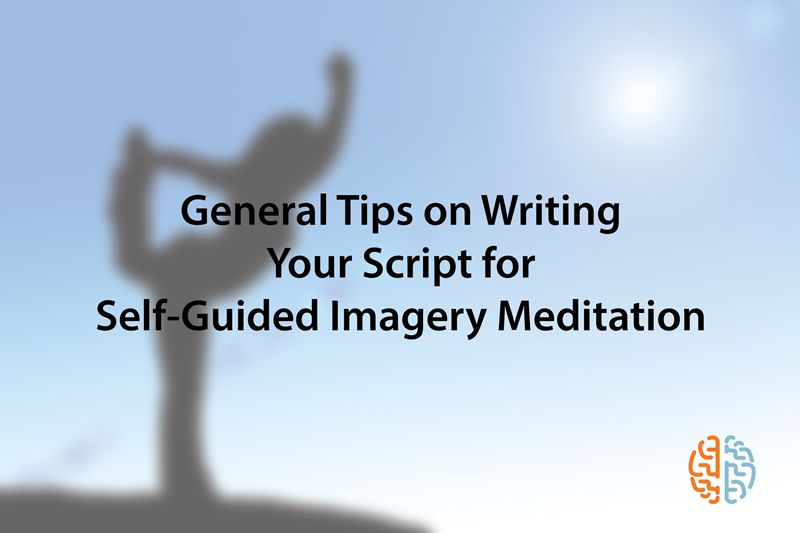 Creating your own script for guided imagery meditation and recording your voice can be interesting because you can be sure that you can relate to every metaphor and scenery you used. But as much as possible, consider having a professional therapist to help you with the script or much better, let an expert guide you through imagery meditation.